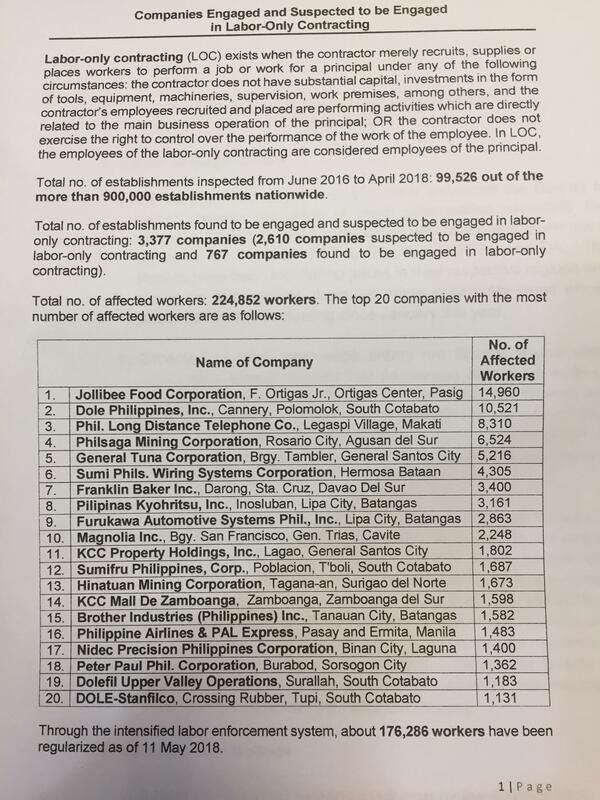 The Department of Labor and Employment (DOLE) released on Monday a list of the top 20 companies suspected of, or have been found, engaging in labor-only contracting. The companies supposedly have the most number of workers affected by the practice which was prohibited by President Rodrigo Duterte. DOLE issued the list after compiling a report on 99,526 out of more than 900,000 establishments nationwide inspected by DOLE in line with the President’s Executive Order 51, which prohibits illegal contracting and sub-contracting. Among the companies on the list, Jollibee Foods Corp. has said it has received an order from DOLE to regularize contractual employees and will follow the process the department has prescribed by appealing the order.